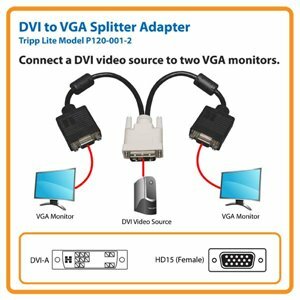 Tripp Lite's P120-001-2 DVI to 2 x VGA splitter allows you to attach two VGA enabled devices, such as monitors and projectors, to your computer's DVI-I port. DVI-I enabled computers are capable of outputting both Analog and Digital signals, so the splitter is perfect for connecting VGA LCD monitors, projectors simultaneously. (For splitting to two DVI-enabled monitors, use Tripp Lite P564-001). Fully molded construction and double-shielding ensures long life and high performance. Supports video resolutions up to 2048 x 1536. Don't settle for less than the best—enjoy superior video quality! This Tripp Lite DVI to VGA Splitter Adapter assures peak performance when displaying a single DVI video signal on two VGA monitors simultaneously. Unlike cut-price cables, the P120-001-2 is manufactured to exacting specifications, using superior materials, for a difference you can clearly see. And we back our pledge of quality with a lifetime product warranty. This genuine Tripp Lite 1-ft. DVI to VGA Splitter Adapter Cable offers an easy, inexpensive solution for splitting the video signal from one DVI port for display on two VGA monitors simultaneously. Featuring one DVI-A male connector for a computer and two HD15 female connectors for monitors, this cable is the ideal solution when you need to display the video signal from a notebook computer for presentations. The P120-001-2 enables you to display the image from one computer on two VGA monitors simultaneously, with resolutions up to 2048 x 1536. It is compatible with any PC or Mac equipped with a female DVI CPU port. The P120-001-2 is designed for short-distance applications. For splitting two DVI-enabled monitors, use Tripp Lite's P564-001. The P120-001-2 is manufactured using top-quality materials. Premium double shielding provides maximum EMI/RFI protection to assure a consistent, clean video signal. The connectors feature integral strain relief for durability and long life. The P120-001-2 is also compliant with RoHS (Reduction of Hazardous Substances) standards, reflecting Tripp Lite's commitment to environmental responsibility. When you choose this genuine Tripp Lite cable, you get superior performance plus peace of mind! We're so confident of the quality of the P120-001-2 that we warrant it to be free from defects in material and workmanship—for life!